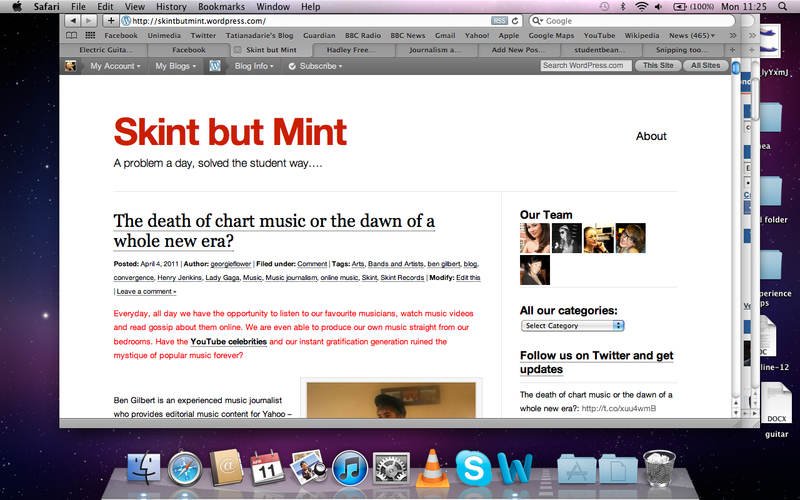 My group blog is called ‘Skint But Mint’. It is a blog about student lifestyle and how to make it easier for students to live abroad. The motto ‘a problem a day solved the student way’ was our creative approach to the blog as there are hundreds of other student blogs on the web and we wanted to make it different. I am very happy with the project because in a short term we have achieved to create a small audience,to motivate them to comment and to visit our blog regularly. Our Facebook page has helped us a lot to develop a small group that was later actively contributing to the blog’s discussion. I think we managed to cover all the subjects that matter for a student and got some interesting interviews with Jo Elvin, the editor of Glamour Magazine and Ben Gilbert, the music journalist from Yahoo!. I liked the fact that we had a lot of personal photos as it made the blog more appealing and colourful. Thinking about what didn’t work, sometimes I thought some post were too long. I tried to read every new post uploaded, and as a reader, it was difficult for me to get to the end of it. I think Skint But Mint can be more successful if we continue to work on it. Initially, I had the idea of introducing an online competition on the blog so that people could get more involved. The competition was about asking our readers to write about some of their problems or upload pictures with food they ‘ve cooked. The prizes would have been taken from studentbeans.com, that has the greatest offers for students in the UK. Due to the lack of time , we didn’t introduce it. Overall, I am satisfied with our work and I got valuable skills in writing and in working in a team, that is never an easy job. Our first session of Multimedia Journalism started with creating a blog ourselves and analysing top blogs across the globe. Also, asking ourselves why are they successful and may be steal some of their ideas to upgrade our student blogs in order to make them look better on the exciting platform of the blogosphere. Jim McClellan, our Journalism tutor, suggested a short list of blogs we could look at. I ‘m gonna mention some of them: BoingBoing, The SartoriaList, Gawker, io9, Go Fug Yourself, Dooce, Mashable, Nick Robinson’s blog and many more. To start, I can definitely say that some of the blogs go beyond the word ‘blog’ and slightly tend to shift into ‘healthy’ news outlets. Each of them, though, has its own community, its own audience and it ‘s different in a unique way. I mostly enjoyed looking through The SartoriaList, a blog that inspires me, though I am not a fashionista, nor have I ever had a keen interest in fashion. But, I really like everything that emphasizes the ‘beautiful’. One of my teacher back home told me once: big shows are not made with big people. It totally links to the concept of this website, although it has photos from the big brands collections from London, Paris, Milano and New York, it focuses more on random people this traveller meets on the street. What I mostly liked about it is that the blog doesn’t focus on the same idea that thousands of fashion blogs share, but it tends to emphasize the difference between the showroom trends and the common people on the street that looked great. His pictures are different, because he captures people in way that allows us to see beyond the surface. Also, an exciting job anyone would like to have, that mixes the best of experiences: travel, photography and fashion. Strongly recommended. I also had a look at Nick Robinson’s Blog that is hosted by the BBC website. It’s a news blog mostly with features, that aim to critically analyze the current breaking news stories. 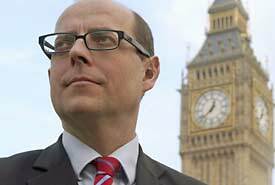 Nick Robinson is a well-known political editor for the BBC. I think he is one of the best political analyst, so it’s my pleasure to read his blog and get a new perspective of what’s happening in the ‘dark’ world of politics. On his blog, I found an interesting article these days with an appealing headline ‘Cameron’s first war?’. The piece adopts a different angle on the ongoing conflict in Libya and questions whether Libya could be the PM’s first war as all military decisions he took before today concerned the Afghan war.